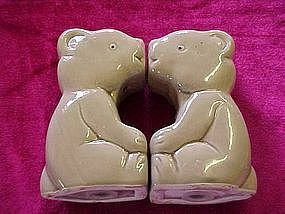 Cute little ceramic kissing bears. They measure 4" tall and are sort of flat shaped. Perfect condition,plastic stoppers, very unique. Very unusual pair of stoneware shakers. They measure2 3/4" tall and are a mix of matte and glaze finish. 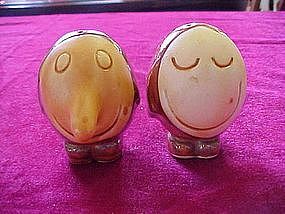 Egg shaped, faces, feet and arms at the side. Perfect condition. An unusaual pair for your collection. No corks. 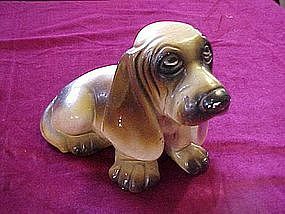 This chalk bank is an oldie but goodie.The dog is a basset hound. He measures 6 1/2" tall by 9 1/2" long. Heavy chalk. No repairs. Great condition for a chalk item. Minor paint chips here and there, and a small nick on the money slot. I think this was done upon casting as it seems the color is over it. Look at those eyes! So very realistic.He wants you to give him a new home. A nice large piece of chalkware. See photos of front and back. 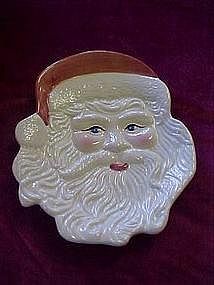 Nice sculpted ceramic Santa head plate. It measures 9 1/2" by 12" and is hand painted. Very festive addition to your holiday table. Stamped WCL on the back. Perfect condition. 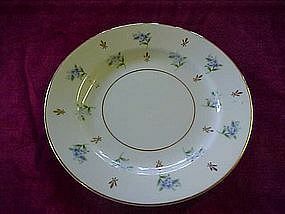 Nasco Japan, fruit arbor pattern. 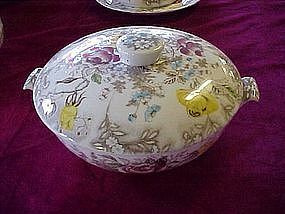 This is the covered sugar bowl with handled. No chips or damages. Some crazing. Great handpainted, watercolor look, all over fruit design. I have other pieces to this set available, see my site. Great hand painted, watercolor look pattern by Nasco Japan. 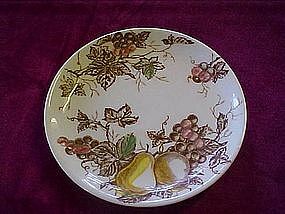 This is the 6" bread plate in the fruit arbor pattern. All great condition with no chips or cracks. Some crazing. I have 5 of these available. Price is per plate. I also have other pieces in this pattern listed. 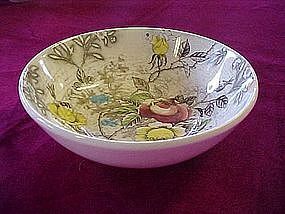 Nasco Japan hand painted pattern, fruit arbor. This is the 6" saucer, with the well for the cup. This is a picture of the bread plate shown (will replace photo later). I have other pieces to this set available also. There are 8 of these in stock. Price is for each. Perfect condition but has crazing. Photo is of a bread plate, saucer has the well. 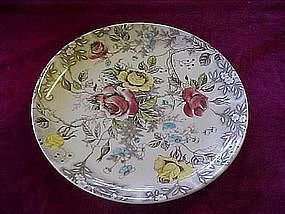 Great hand painted Nasco Japan "rosevine pattern" Large chintz rose pattern with a watercolor look.I only have this one, 10 1/2" dinner plate to the set. Good condition,no chips, but with gentle crazing. Other pieces to the set available. 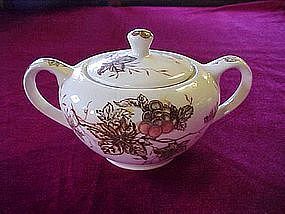 Rosevine sugar with handles and lid. By Nasco Japan. A pretty hand painted large rose chintz pattern, with a watercolor effect. Perfect condition! No damages. Other pieces to this set available also. See my catalog on the site. 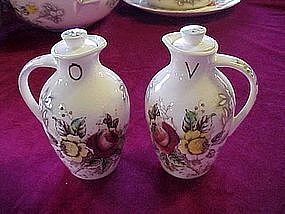 Hard to find vinegar and oil cruet with their original lids. This is the Nasco Japan pattern "rosevine". Lovely large hand painted rose chintz pattern with a watercolor effect. These are in GREAT condition with NO damage. They measure 5 1/2" tall. Price is for the pair. I have other pieces to this set available also. Check out my catalog. 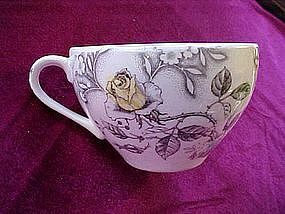 Nasco "rosevine" cup. 2 1/2" tall and has a diameter of 3 3/4". Large hand painted rose chintz pattern with a watercolor effect. Measures. Pattern inside and outside. No damages, but crazing on the inside bottom. I only have one available. Other pieces to this set are listed on my site. Great "rosevine" pattern by Nasco Japan. Nice big hand painted rose chinz pattern with a watercolor effect. This is the 6" cereal bowl. A harder piece to find in good condition. I have two available in good condition with only minor crazing @ $10.00 ea. Also have one with a sizeable crack at the top at 50% off. Other pieces to this great set available, check out my catalog. Very hard to find pieces for this set. Made by Nasco Japan in the rosevine pattern. This is the carafe (no lid) but has the warmer! 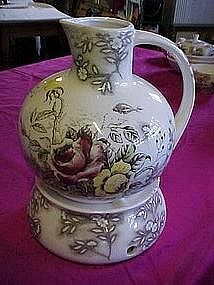 Warmer is in PERFECT condition, but carafe has two small hairline cracks at the top (photos on request). Could probably be bleached out, to not be noticeable at all. Both pieces together measure 9 1/2" tall. I have other pieces to this set available also. Check out my catalog. 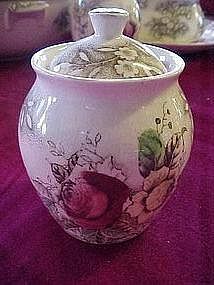 Hard to find jelly jar in Nasco rosevine pattern. Hand painted large chintz rose pattern with a watercolor look. Jar is 4" tall plus the lid which makes it measure 5" over all. Lid has a hole for a spoon to sit inside jar. (No spoon). Perfect condition. I have a photo to show the difference in the size of the jelly jar compared to the marmalade jar, email if you would like to view it. I have other great pieces to this set. Check out my catalog! 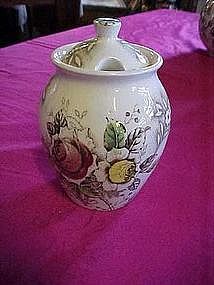 The marmalade jar with its lid, in the rosevine pattern by Nasco. This measures 3 1/2" tall plus the lid which makes it 4 1/2" over all. Lid has a cut out for the little spoon. (not included). 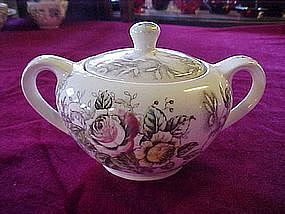 This is a pretty hand painted large rose chintz pattern. It has a watercolor effect on the decoration.Perfect condition! I have a photo to show comparison for this marmalade jar to the larger jelly jar if you would like to view it, email me. See my catalog for more pieces to this great set. 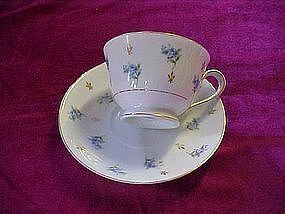 This is a matching cup and saucer in the remembrance pattern by Noritake china. Dainty blue flowers scattered on the pristine white china, trimmed in gold. Price is for a set of one cup with one saucer. I have 5 sets available. Perfect condition. See my catalog for more pieces to this set.